Which Religious View is Correct? Of all the historical people in history, Jesus Christ stands out as being the most culturally significant. B.C. designates the epoch "before Christ." A.D. is an abbreviation of the Medieval Latin phrase "anno Domini nostri Jesu Christi" which translates into English as "in the year of our Lord Jesus Christ." In an attempt to remove any reference to Christianity, B.C. 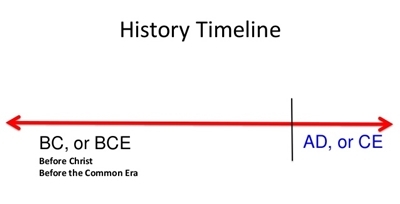 / A. D. is being replaced with BCE / CE which are abbreviations for "Before Common Era / Common Era;" however, the dividing point of the chronology of world history continues to be Jesus Christ! Christmas commemorates the birth of Jesus Christ each year and is symbolized with the Nativity of Jesus. The goodness of God giving such a precious gift is so valued that Christmas is associated with gift giving and has become a cultural celebration around the world. Easter commemorates the resurrection of Jesus Christ each year and is symbolized by the unoccupied crucifixion cross. This defining moment in Christianity, enabling one to be born again, has become a cultural celebration and symbolism of Spring. Jesus' "Golden Rule" (Matt 7:12; Luke 6:31), which finds its basis in the Old Testament, has been adopted by virtually all cultures around the world.